With a love of food and travel, George and Linda found their calling in Tuscany and now are bringing their love of food and adventure with them to San Miguel de Allende. George, a pilot and Linda, a school teacher, spent their summers traveling the world in search of local customs. “I never wanted to be a tourist--I wanted to be a local,” says Linda of her years of travel. “I found myself bringing home souvenirs from local grocery stores.” During their journeys around the world, George and Linda were lucky enough to live in a border town in Texas where Linda taught the local shop owner's children and George taught flying. This allowed them to experience "the real" Mexico where they got to cook and eat in both obscure and off-the-beaten path kitchens. During his "travels" to Mexico (and beyond) George could often be found in the kitchen making tamales with the local women! "I want to share my experiences and passion with our guests,” says George. "I feel very excited and fortunate to have a friend that introduced us to San Miguel," says Linda. "We fell in love with the people, the food, the art, and the sense of community immediately. We knew we had to find a way to share our experience with our guests." 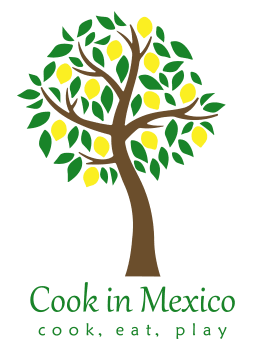 And so Cook in Mexico was born! These two high-school sweethearts, both from New Orleans, combined their love of food and travel with Cook In Mexico. Today they share their love of San Miguel with a dose of Southern Hospitality. “We want our guests to see and feel like they live here, so we give them a true authentic visit." George, Linda and their micro dachshund, Talula, spend their winter in San Miguel, so you can often find guests sitting with George around the pool, drinking Mexican beer (sweet tea) and telling stories. So, roll up your sleeves and come roast peppers and make sopaipillas in San Miguel!